The US dollar is higher across the board against major pairs on Friday. Pound under pressure as EU decides on extension. Supply disruptions push oil prices higher. Yellow metal rebounds before weekend. The U.S. dollar is higher across the board against major pairs on Friday. The greenback got a boost from the March U.S. non-farm payrolls (NFP) report that showed the economy added 196,000 jobs and an upward revision to the February numbers. The wage component did not do as well with a lower-than-expected gain at 0.1 percent that validates the dovish stance of the U.S. Federal Reserve. The central bank has taken off the board all interest rate hikes that were forecasted last year. 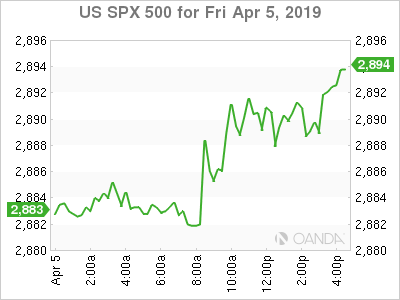 The immediate market reaction after the report triggered a rise in risk appetite with investors selling the dollar after President Trump once again pressured the Fed to lower rates. The Fed will release the minutes from its March FOMC meeting on Wednesday, with no surprises expected, but they will make for a dovish reading of the economy as Fed speaker speeches have been full of patient language. The dollar on Friday as once again its crown as a safe haven remains untouched, and going into the weekend investors reduce their exposures in their portfolios. 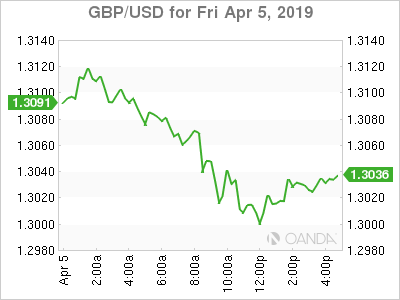 The GBP/USD wrapped up the trading week nearly flat on a weekly basis despite all the Brexit drama that unfolded this week. Lack of consensus will most likely result in an extension for the UK divorce from the European Union, that in a shock twist might see them stop the proceedings. British PM Theresa May is pushing for her deal going so far as crossing party lines to ask for the opposition's support. The gambit is unlikely to succeed, but after offering her resignation to members of her own party failed, it was the only option available. April 12 is the new deadline that needs to be extended. The EU leaders will meet to debate whether to grant the extension or trigger a hard exit. Economic data will be plentiful in the UK with GDP and manufacturing data the biggest highlights. Brexit has had negative impact on growth that is now forecasted to slow down to 0.2 percent on monthly basis. Global companies have begun to shift their investment out of the UK as the process is not expected to be wrapped up one way or another in the short term. Oil rose on Friday despite the dollar getting a boost from a stronger-than-expected NFP report. 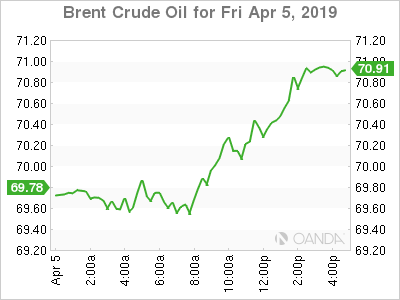 Oil has continued to rally after U.S. sanctions against Iran and Venezuela have combined with the OPEC+ efforts to limit production. 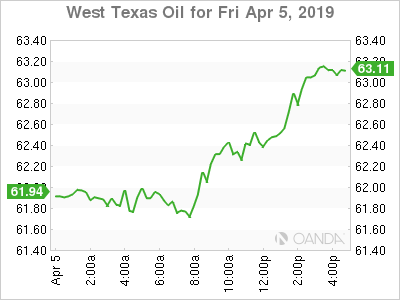 U.S. production is forecasted to ramp up after a brief pause and one of the biggest hurdles for energy prices this quarter. OPEC will meet this week in Vienna, but with the cancellation of the OPEC+ ministerial meeting last month, the focus is now on the larger group as an extension to the production cut agreement has been signaled by Saudi Arabia and Russia. U.S.-China trade negotiations have been crude positive, but with so few details, it could easily turn to negative if talks face something larger than this week's speed bump. Comments from both sides have mentioned progress, but so far there is little in the way of details on how close the two really are. A potential supply disruption as the situation in Libya escalates that before long could end up in a full-blown civil war. Supply disruptions will keep prices at current levels, but a correction could be in the works as stability and higher U.S. production threaten the oil rally in the second half of the year. 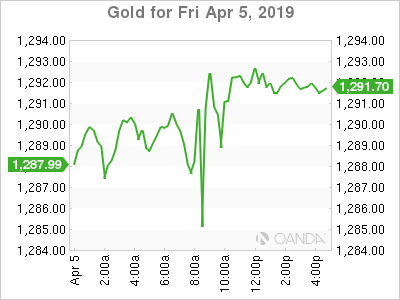 Gold rose 0.12 percent on Friday, but did not manage to climb out of the red for the week registering a 0.21 percent loss. The yellow metal could not overcome the combination of strong U.S. economic indicators and a rise in risk appetite that drove investors to look beyond the safety of gold. Gold remains a viable diversification asset for investors as uncertainty still surrounds Brexit and the U.S.-China trade. The metal is back as a refuge during volatile trading sessions, and with the Fed on pause, the U.S. dollar could lose momentum in the second half of the year if risk events get sorted before then. The White House is putting pressure on the Fed to cut rates, which could turn into a positive for gold as geopolitical headwinds will continue to dampen global growth and put a more dovish slant to central banks. Fed minutes to be released this week will complete the dovish picture being painted by the U.S. Federal Reserve. The central bank has stressed patience as it put the brakes on its attempt to normalize interest rates. Macro headwinds have slowed down the American and global economies, but the opportunity to turn things around remains, which is why equities have rebounded awaiting news on the U.S.-China trade deal.